It is considered one of the most fragrant deciduous azaleas. Clusters of pure white blooms with pointed petals emerge from soft pink buds in early to mid-season. 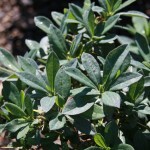 It is a compact and rounded shrub that is heat tolerant. The handsome foliage is bluish green all summer, turning yellowish in the fall. 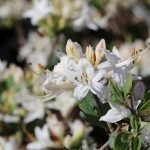 It prefers moist, well-drained acidic soils, in full sun to partial shade. A polyploid plant developed by Briggs Nursery.